Do we need a particular season (read as summer) to enjoy a good cocktail? Of course not! Today's recipe - Curry Leaves Mojito is one such tastefully created drink recipe with an Indian twist and which will surely become a showstopper of your next party. It is time to showoff your uber trendy and impressive cocktail making skills with much flair and gusto. Read more to know how.. I am a huge lover of iced teas. It doesn't matter how the weather is outside, a good glass of iced tea can instantly transport me to a blissful state and am happy there, with an invisible Do not Disturb sign hanging around my neck. When it comes to cocktails, I am an occasional drinker. Good or bad, things have to be at an extreme end for me to order a cocktail. I realized it is a indeed a pattern and all I am trying to do is subside the overwhelming feeling that builds inside me when happy or sad. I know, it is a bit of extreme. What can I say, some weird habits form over time and are really hard to shrug off. At home, I hardly make a cocktail. But, this time when the folks at Recipe Redux chose the theme 'Spirited Redux', I had to put some thought and make one. :-) - Curry Leaves Mojito. Doesn't it sound fancy? Subtle and ridiculously good, this is actually the first time I liked a mojito. Lost deep in thought, I drank my glass of goodness and happily called it a day! Since the folks of Urbandazzle are running a cocktail contest exclusively for participants of Indian Food Blogger Meet, am sending this drink as an entry to them. I think this mojito would look a ala mode using this Urbandazzle glassware. What say? Gone are the days when a bunch of mint leaves are muddled into the cocktails. Mixologists, are thankfully playing around with a variety of ingredients these days giving us a a whole new experience of delightful happy hours. In a glass, muddle about 8 fresh curry leaves, juice of half a lemon and 1 tsp sugar. Top with ice cubes and 1/4 cup of vodka. Serve immediately. i'm like you... iced tea please (flavored, if i'm feeling really crazy). but a fun, creative cocktail will change my order for sure. i'm totally intrigued by the curry leaves. it's like a boozy curried lemonade! very cool... thanks for sharing!! Yum! Love Curry Leaves!!! I need to add these to my garden...great combo! You've inspired me to grow some curry-simply gorgeous drink! Cheers!! Very different, Siri I must try this soon! 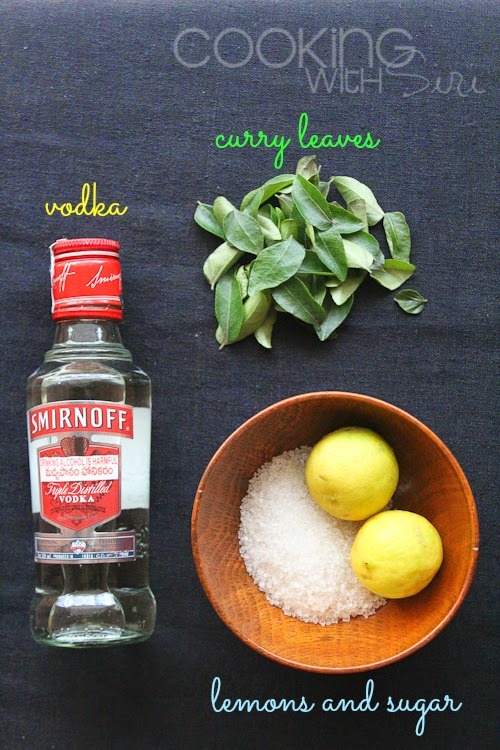 I've been making mojitos this summer and now I can't wait to try them w. curry leaves!